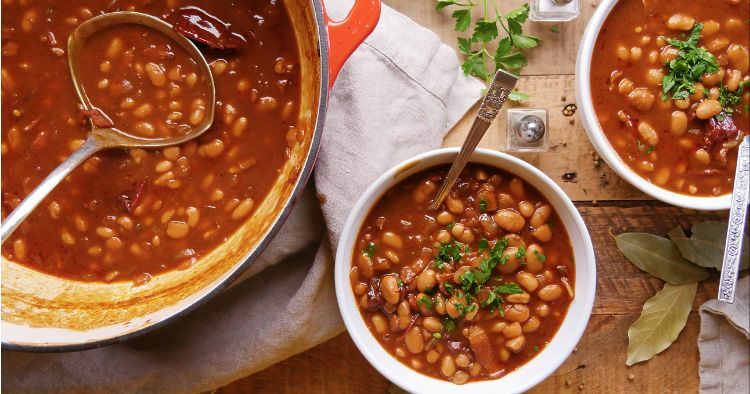 Smoky baked beans are one of those foods that holds a powerful, specific memory for many of us. I remember eating them at summer camp growing up, and thinking that this was what cowboys ate in the wild west. 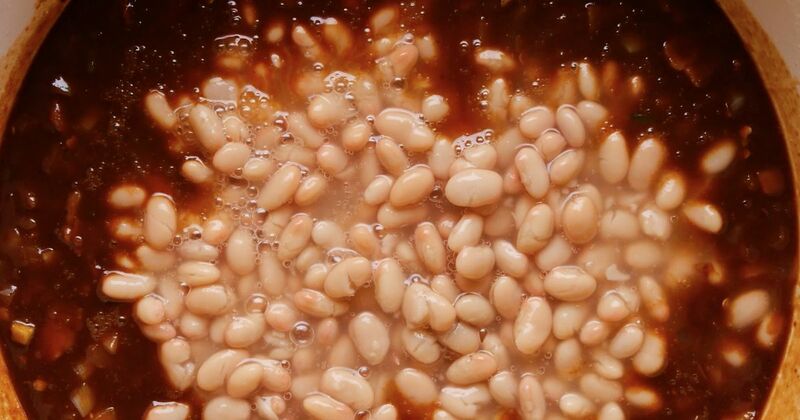 It turns out the cowboys actually ate something called, quite appropriately, "cowboy beans" (or "chuckwagon beans"), but they're not too far off from the smoky, tangy beans we know and love. Their version used pinto beans and ground beef, and this one uses Dijon mustard and Worcester sauce. Oh, and bacon! I'm looking forward to creating new memories with this recipe; it’s spicy enough to make you sweat, and easy enough that anyone can make it. Plus, did I mention it has bacon? Think of a bad bacon memory. I dare you. Add the bacon to a deep saucepan and cook over a medium heat until some fat renders, about three minutes. Add the diced onion to the saucepan and cook until it begins to turn translucent and the bacon has become crispy. Add the barbecue sauce, beer, molasses, mustard, brown sugar, Worcester sauce, soy sauce, ketchup, chilies, and jalapeño and stir to combine. Transfer everything to a baking dish (ideally one with a fitted lid, although you can cover it with aluminum foil if necessary) and bake for an hour, checking after 40 minutes.